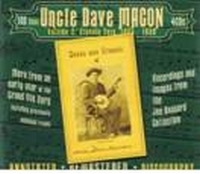 This is the second four-disc box set JSP Records has issued of Uncle Dave Macon, which means close to 200 tracks of old-time folk pieces, vaudeville standards, restructured minstrel songs, and more cornball humor than you can shake a banjo at (Macon had a habit of stopping a song in the middle, telling a short joke, then moving on back to the song). Not bad for a musician who didn't begin recording until he was 50. Before 1924 he owned and operated a mule-driven hauling service, but eventually similar businesses using trucks cornered the hauling market, and Macon became a professional musician -- and he never missed a chance to slam the virtue of trucks and praise mules in his routines. Macon didn't really understand the recording studio, and these tracks sound very much like a performer in front of a live audience as he introduces and explains songs, stomps his feet, and moves all about the microphone exactly as he would on stage -- which made him a nightmare for recording engineers. Past all the cornball bluster, though, was an energetic and charismatic performer who was a more than capable banjo player, and he single-handedly saved countless folk and string band songs from extinction by tracking them before they vanished into America's musical past. Most of Macon's more famous pieces are in JSP's first set, but there are some scattered gems here, including the intricate waltz called "He Won the Heart of My Sarah Jane," the bluesy "Oh Lovin' Babe," some kinetic banjo on "Come on Buddie, Don't You Want to Go," and a pair of lovely fiddle and banjo instrumentals (with Sid Harkreader on fiddle), "Bile Them Cabbage Down" and "Arkansas Travelers." Most of the fourth disc is made up of sides by brothers Sam & Kirk McGee (with Macon occasionally sitting in on banjo), and these are a special delight, especially Sam’s breat.htaking acoustic guitar lines. Four discs are a lot of Macon, and most casual listeners would be better served by picking up a singl -disc collection, but archivists and collectors will treasure this set of his lesser-known sides.